It is absolutely terrible what has happened to Nepal, but we can do something about it! come along to Bar Twenty One at Sky city from 6:30pm Thursday the 21st May and bid on silent and live auctions. All of the money will go straight to the Himalayan Trust and filtered directly to those in need. 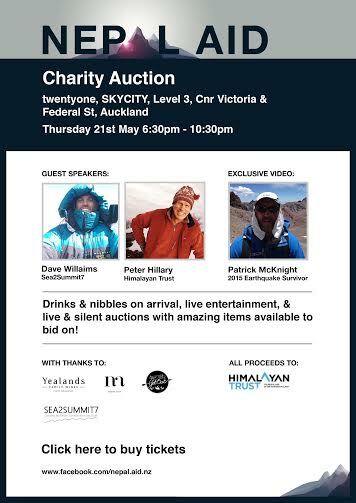 Peter Hillary will be there to speak and collect the money raised and I will be also giving a special Nepal Aid Sea2Summit7 presentation. We have an exclusive detailed video testimony from earthquake survivor Patrick McKnight who was at camp 1 on Everest when it happened.